Dumpsters near the train station in Gabrovo. From left to right: Bio-trash, bio-trash, recyclables, glass, recyclables, recyclables. We use the dumpsters a block from our house, just before Lidl. I take out a small bag of trash with me whenever I am shopping and toss it in the dumpsters on the way to the store. But one morning something was different. I noticed it from a distance— two bright yellow dumpsters replaced our beat up metal ones. As I got closer I saw there were actually two large yellow dumpsters and a smaller brown trash can. The brown trash can had a label indicating it was for bio-trash. Both yellow dumpsters were for paper, plastic, glass and metal. I looked from one yellow dumpster to the other. I looked at the brown trash can. My bag was heavy in my hand and I was pushing a stroller full of a squirmy toddler. I carefully read the labels again. After all, Bulgarian is my not my first language and I might have been missing something. But no, I understood the labels perfectly. What I didn’t understand is where I was supposed to throw my bag full of dirty diapers. Obviously they were not bio-trash, but they were also not recyclable. Where was the container for “evil things we shouldn’t be using that destroy the world?” That’s the one I needed. I had to put my trash somewhere. After about five minutes with a fussy toddler who wanted to move on, I threw the bag— diapers, bio-trash and recyclables all mixed together— into one of the big yellow bins. That night I told my husband that there was a new trash system. “That’s great!” he said. He’s a scout and likes the idea of recycling. In theory, so do I.
Label on Newer Recyclables Container, Listing Items that can and cannot be thrown away. Diapers and other hygiene products are listed under the ‘unacceptable’ category. A few months later we went to Vienna for WordCamp Europe and rented an AirBnB to stay in. The first thing we noticed when we walked into the apartment was a large binder with instructions about the city. There were the usual tips on dining and advice on transportation. Next, an entire page outlined the trash system. It told us clearly, in several paragraphs, how to sort our trash and where to throw it away. At first, I laughed at it. It’s just trash, it can’t be that complicated! Then I found myself nervous. I wondered if I was doing it right and what would happen if something ended up in the wrong bin. I specifically made purchases that had less packaging so I didn’t have to worry about throwing things away. 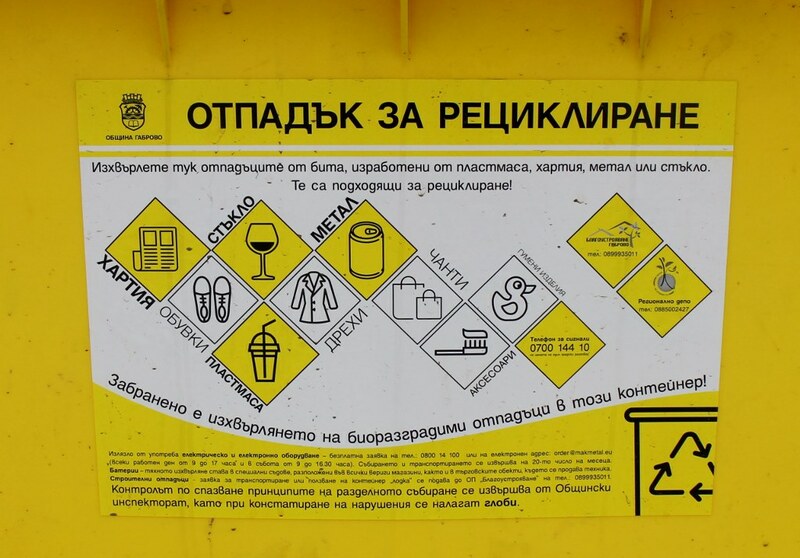 But by the end of our trip I was grateful for the tersely worded education in recycling and trash sorting. As I threw out the bags in their proper dumpsters, I felt empowered. 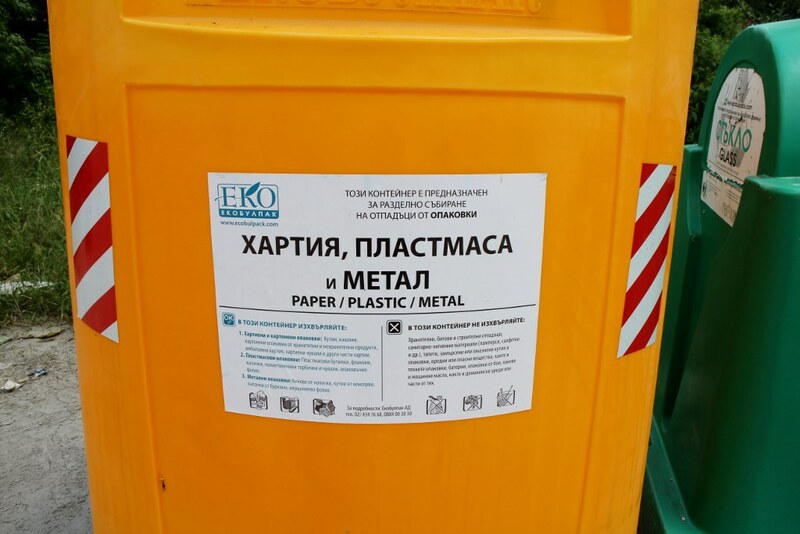 Then I returned to Gabrovo, Bulgaria with our two options— recyclables and bio-trash. Exasperated, I throw everything into one bin and move on. I want to follow the rules, like I did in Vienna, but the diapers have to go somewhere. 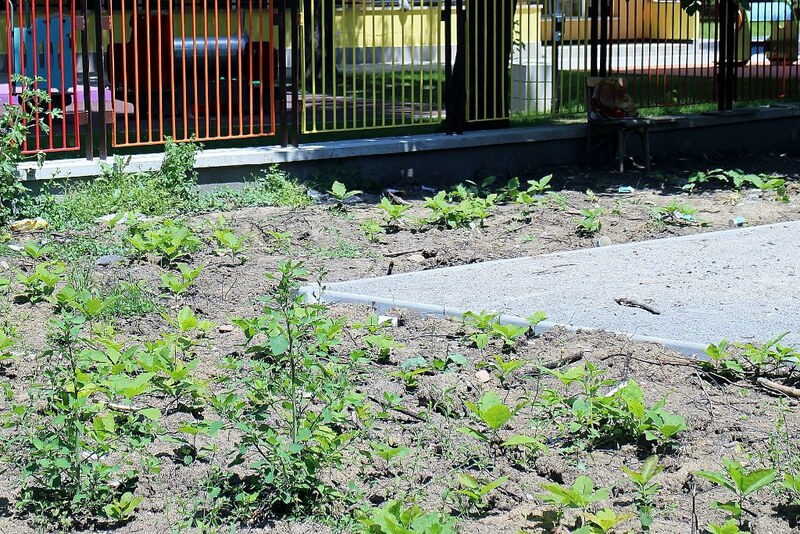 But instead of instilling confidence in the new system, these containers have left many residents of Gabrovo confused and a little distrustful. 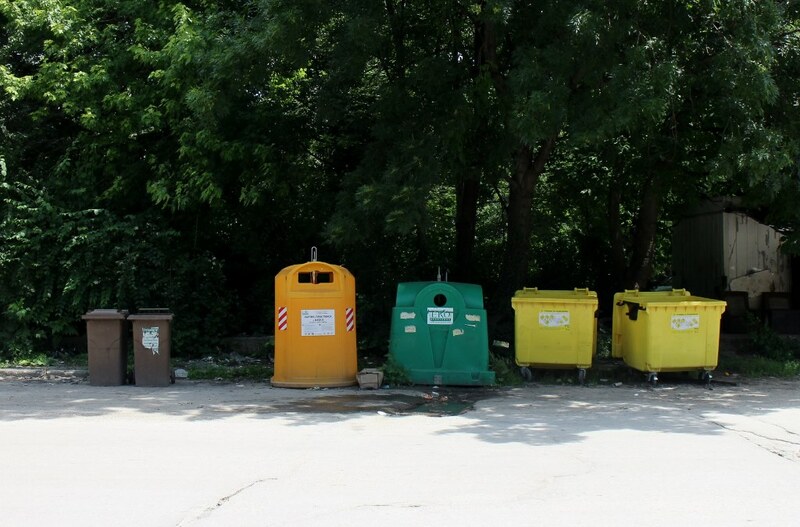 I turned to a group of Gabrovo mothers to ask where I should be throwing away my diapers. One friend told me it doesn’t matter because only one truck goes by in the mornings, mixing the trash together. Another told me there are two types of yellow dumpsters, one of which accepts non-recyclable material. Yet another told me the green dumpsters are for these items. Some people were confident in their answers, despite the conflicting responses. But most people admitted they weren’t really sure which was the correct receptacle. Some said it was pointless since people still throw their trash in the parks rather than the dumpsters. A park being built. Coffee cups and food wrappers are thrown on the ground, despite dumpsters located less than 100 meters away. It leads me to wonder why there was not a push to educate the public before introducing the new containers. Why did they just show up one day, without warning? Apparently there was an invitation to a town meeting before they were placed, but it was barely publicized, and most initiatives that mentioned the program concentrated on educating children rather than inviting adults into the project. It’s easy to educate children. They don’t have bad habits and we can reach them at school or through youth organizations. It is harder to reach the adults in a town and ask them to change the habits they have developed over a lifetime. Creating faith in a new system and making people realize that this 26 million leva went towards a project that is worthwhile rather than just another failed promise of development is an art-form at the pinnacle of public relations. The new containers may be the least expensive part of this project, but they are one of the most important aspects in turning an invisible infrastructure improvement into a form of community development, and they sadly failed. Maybe with more promotion— a letter, some posters, or a website— a mother would know where to throw away her used diapers.